You might not think of Michael Jordan as someone who had anything important to say, but actually he had some really interesting and thoughtful things to say or being a business speaker. Sometimes we need to be reminded that we are capable of greatness but of course, that we need to believe in ourselves first - which is the most important part. 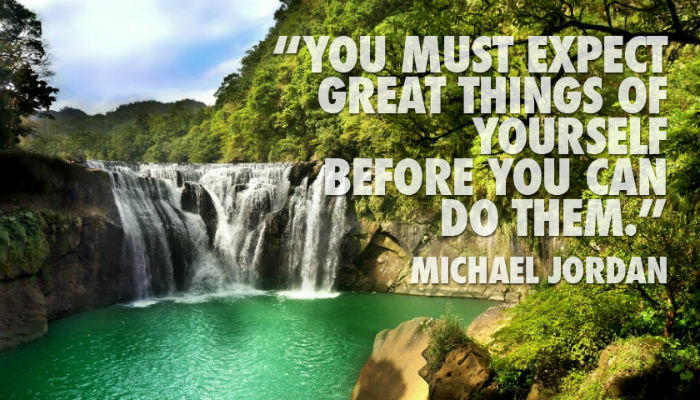 This quote by Michael Jordan reminds us that we need to trust our instincts and believe that we are capable of doing something before we can do it and that is a quote that the team here at Eco 2 Greetings really believes in. What we also believe is that this quote really does all of the speaking so we didn't need anything too bright and bold to take away from that with our corporate ecards. We wanted to stay away from the usual basket ball or sporting background and instead choose this beautiful, relaxing water scene which gives a real feeling of tranquility which is perfect against this quote. We chose a bold text in capital letters to help the quote stand out against the backdrop of the waterfall and rocks. Want something else? Browse through the rest of the items we have on offer at Eco 2 Greetings in order to find something to suit. In particular we specialize in corporate holiday ecards.